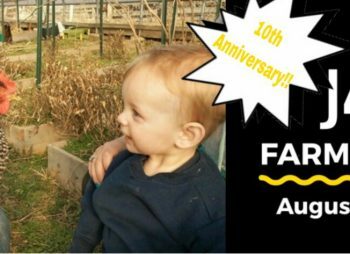 J40 Farm Crawl is Celebrating their 10th Year Anniversary! A day filled with food, farm tours, wagon rides, local artists, history, wine tasting, hand crafted furniture, and so much fun for the whole family! Start the day off with a delicious home cooked breakfast at the Amish School, than wander down the road to explore the 7 different participating farms, businesses, and museum along the route. Here at Bloom and Bark Farm you can explore our gardens and greenhouses, see how a hand-crafted clay oven bakes delicious artisan breads, sample fresh produce and bread with a cold glass of mint water. 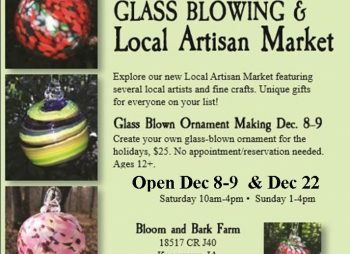 Tour our Glass Blowing Studio and watch demonstrations by artist Tim Blair. We have been cutting trees and stripping bark for the Hobbit House. We have the wall uprights in place and hope to have the roof supports up before the Crawl. Progress is slow but steady on this awesome structure. This year we will also have Live Music throughout the day here on the farm! All of these great Business will be set up here at Bloom and Bark Farm. The Villages Folk School will be set with several artists on hand demonstrating and selling their art. Along with providing information about their classes. Crane Winery will be sampling their delicious sweet wines. Hershey’s Honey will be set up and selling all the good stuff their bees produce. The Calico Press will be demonstrating letter press and have posters, cards and t-shirts available. Sonja Hoie will have yarn and textiles for sale, created from her flock of Icelandic Sheep which graze on the Thomas Home Farm. 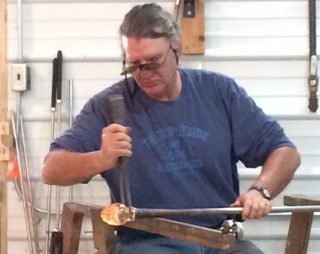 Douglass Blackwolf is one of our amazing local blacksmiths. He will be set up and demonstrating this ancient art. He will also have some of his forged pieces available for sale. Mrs. Mercantile (aka Alline Anderson) will be selling her amazingly delicious pickles along with her delightful decoupage collage boxes. You will also have the opportunity to explore all these amazing businesses and farms just down the road: Lengacher’s Greenhouse & Variety Store, Yoder’s Indian Creek Furniture, Richardson’s Point, Koldt Barn, Troy Academy, and Milton Creamery. 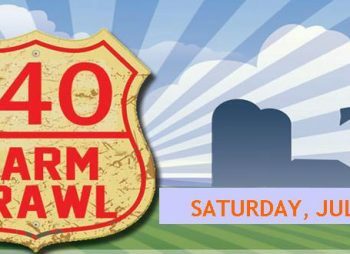 The J40 Farm Crawl is a fabulous opportunity to share summer family fun along Iowa’s Historic Hills Scenic Byway and celebrate the rural local businesses and farms that add vibrancy to the Iowa landscape. 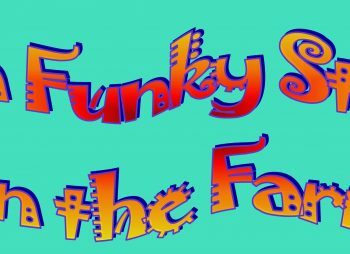 A day filled with food, farm tours, wagon rides, local artist, history, wine tasting, hand crafted furniture, and so much fun for the whole family! Here at Bloom and Bark Farm you can explore our gardens and greenhouses, see how a hand-crafted clay oven bakes delicious artisan breads, sample fresh produce and bread with a cold glass of mint water. Tour our new Glass Blowing Studio and watch demonstrations by artist Tim Blair. The Village Folks School will be set up on Bloom and Bark Farm with several artists on hand demonstrating and selling their art. Along with providing information about their classes. Crane Winery will be sampling their delicious sweet wines at Bloom and Bark Farm. You will also have the opportunity to explore Lengacher’s Greenhouse, Yoder’s Indian Creek Furniture, Koldt Barn, Troy Academy, Pittsburg General Store and Milton Creamery.